Agencies all over the world are looking to roundabout art to provide aesthetically pleasing options to roundabout real estate that is otherwise difficult to maintain. 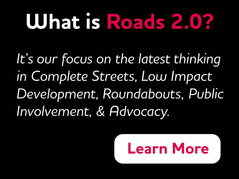 As we continue along our Roads 2.0 series, I’d like to share a Q/A session I had with Brad Emerson, Special Projects Director with the City of Bend, Oregon regarding their successful roundabout art program. Upon arrival into Bend, I stopped into the “Visit Bend” visitor center, picked up a map showcasing their collection and participated in a self-guided tour of their “Roundabout Art Route”. They have turned these impressive works of art into an opportunity to promote tourism. It also provides a firsthand look into the infrastructure changes and growth happening within their community. Bend’s Roundabout sculptures were honored by Americans for the Arts among the 37 most innovative approaches to Public Art in the country. They have also been highlighted in New York Times and the Arizona Republic newspapers. Brad shared some of their processes and lessons learned. As the town started implementing roundabouts, Art in Public Places (AiPP) approached the City about gifting roundabout art to the City as a means to beautify the community as well as provide broader exposure of art to the general public. How did the City commission the pieces? The artwork was donated by AiPP, which is funded by the Bend Foundation. Their goal is to provide art to various locations throughout the City and showcase a wide range of artistic styles. As funding permits, AiPP issues a call for art submissions to display in public areas. What was the protocol for selection? There wasn’t any protocol for the first few that were placed and there was a lot of community discussion and controversy surrounding who gets to select the art. As a response to this, the City Council entered into an agreement with AiPP that requires that the public be presented three options and have the opportunity to vote on their choice. AiPP will place a notice in the paper and are required to allow two weeks to provide input. What is the estimated value of all the artwork? Approximately $25,000 to $150,000 each. Where are the pieces from? Mostly from artists within the Pacific Northwest and California and even some local Central Oregon talent. I noticed from the tour that there are several different materials used? What materials would you recommend others pursue? What are easiest to maintain? Several different materials. Cor-ten steel is a good product and withstands the elements. There is also stainless steel and brushed aluminum. The colored pieces have a high quality paint baked on them. Bronze is a difficult material to maintain and while several artists prefer to use bronze they do pose significant ongoing maintenance challenges. All art pieces are bolted to concrete and require structural design and inspection after installation. How does the City maintain the art? The City maintains an operations budget to preserve the art. The City’s Volunteer Coordinator directs volunteers who maintain the roundabout landscaping. Each roundabout is different - some have high mounds, some have minimal landscaping. Are the pieces distracting to drivers? The safest roundabouts are those with a visual obstruction in the center. You want the focus to be on who or what is approaching to your left. Landscape architects design the landscaping in each roundabout. Most of the artwork has been placed after the fact, which can be a challenge as artwork must be placed to avoid the various utility easements that can crisscross the roundabouts. What challenges have you faced with the art in roundabouts? Their location is not very accessible to close up viewing which can be a challenge in that, in a few instances, we have had people cross traffic and enter the roundabouts to get a closer vantage point. We have also dealt with two pieces being hit by drunk drivers and there is the occasional instance of vandalism. The community’s favorite piece, as voted on in the local weekly paper, is Redsides. These red trout appear to be swimming and change direction with the wind. 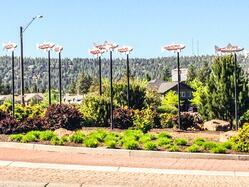 View this slideshare to see some of the artwork in Bend. If you have more questions or would like to share your roundabout art success stories please comment or feel free to call/email me.